This is a 'compact', contained, close and appropriately intimate account of Bach's Johannes Passion. It was written over the first winter during which Bach was responsible for church music at the saint Thomas and Nicholas churches in Leipzig. The performance was at the service of Vespers on Good Friday 1724. In part because the Saint John Passion contains more expansive, extrovert and discursive music than the Matthew Passion, and in part because its geographical settings are more explicit (the Kidron Valley, the palace of the high priest Kaiphas, at Golgotha, and at the burial site), it's seen as more overtly dramatic, more unrestrained and generally less reflective than the Matthew Passion. In that way the St John would seem potentially to confirm the fears of Bach's Leipzig employers that the Cantor might be tempted to write music of more operatic and pious intent and stamp. Director and violinist, Monica Huggett's, conception strikes an interesting balance. It's neither so outgoing yet intense as that of Eliot Gardiner (on Soli Deo Gloria, 712) nor as restrained as that of Sigiswald Kuijken and Gustav Leonhardt (on Deutsche Harmonia Mundi, 667402). Huggett, her soloists, Cappella Romana and the Portland Baroque Orchestra are more down to earth; more transparent in, for instance, 'pushing' the recitatives our way in order to make their impact. They’re more 'busy' in exposing the unfolding story to us. There is less declamation, more narration. Although there are places where the singing has to be described as imperfect, on the whole it's convincing and pleasing. It's almost impossible for us to respond to either of Bach's extant Passions as his congregations must have reacted in the 1720s: the previous models were more dour, more formulaic, purely Biblical, more … 'routine', almost. Huggett's unfussy, almost at times undemonstrative approach might well come close to (such) aspects of Bach's first performances - aware as he was that eyebrows would be raised at the chromatic runs, say in Da führeten sie Jesum [CD.2 tr.2]. Thus the dramatic qualities - even of the dialogues and responses - have been downplayed in this account; not drained. It’s also more implicit because it's expected that you pay close attention to the words. The articulation and enunciation of the text are very clear indeed at all points by all performers. This is a period instrument performance too. Some attempt has been made to use authentic combinations of instruments … flutes are omitted, for example, which confers more of a genuinely Baroque and less Galant sound. Yet the inclusion of both organ and harpsichord and an appropriate array of strings keeps the work's richness. 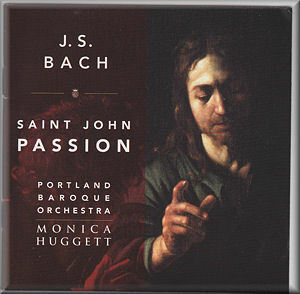 Huggett is more specific: the Saint John Passion has for her been more intimate, more immediate, on a smaller scale than the colossal Matthew Passion. Indeed such is the overall impression that this compact yet inquiring interpretation makes on the listener. It attends to detail, ferrets out the particularities of tone, mood and intention of each aria, chorus and recitative. It is full of expression, yet fails to linger when to do so would be asking more of the forces involved than they should bear. The obbligato working with Erwäge, wie sein blutgefärbte Rücken [CD.2 tr.6], for instance, is there emphatically to support, point up and colour the text; not as a decorative afterthought. At the same time such singing as this here by Jacques-Olivier Chartier is spontaneous, alive and with every effort to be 'real' and immediate, rather than oratorical. Again, couldn't this be close to how Bach imagined his work should be received at its first performance? Huggett supplies a short note in the serviceable booklet which also contains text in German and English. In it she is careful not to allude to the continuing debate or controversy about the forces (one to a part, or not) which Bach may or may not have used - and hence what a historically-aware performance in the twenty-first century should aim for. Yet by employing one to a part she allies herself firmly with those who believe that the grandeur and impact of Bach's music is just as evident in a 'chamber' environment and with chamber forces as when any more expanded size of instrumental and vocal performers is used. Indeed, the vigour, drive and careful diction, the emotional charge, sensitivity and sense of ensemble all allow Bach's highly emotional Passion to affect us as it should. The humanity of the religious occasion which it marks is never in doubt. Our ability as listeners to empathise and identify with the protagonists is neither compromised nor overdone. A good balance. The acoustic of St. Anne's Chapel at Marylhurst University in Oregon could never be described as resonant or overwhelming. Intimacy and immediacy again. Huggett's tempi never lag. Whilst this may not be a first choice for your Saint John Passion, it certainly carves out a niche for itself and is worth hearing. This is a compelling, persuasive yet smaller-scale period instrument account of Bach's less well-known Passion by performers who obviously adore the work and bring out most of its strong points.